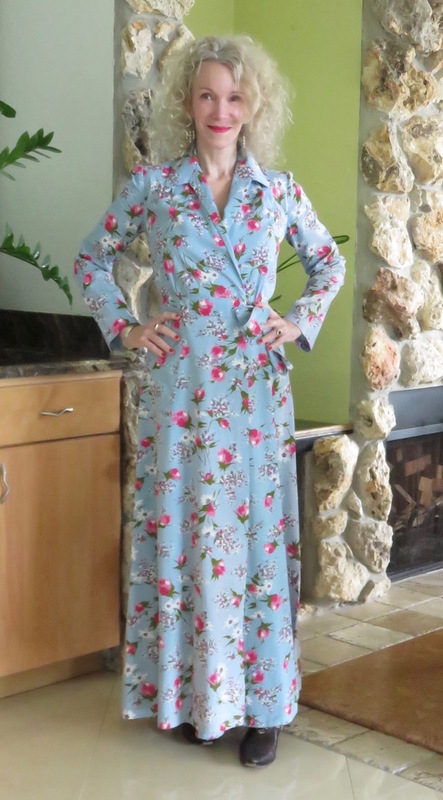 I adore this vintage 1940’s housecoat, and have worn it out of the house many times. So far, no arrests. I just love the cheerful print and the sturdy cotton material. Many of my vintage 40’s and 50’s pieces are fragile now, and can’t take a good washing. This dress can. I can’t remember where I found it, but I’ve had it for at least six years – probably via eBay. It’s not a dress to wear to the office, I admit. It’s one for going out for tea or margaritas, or to a house party with a couple of friends. Of course, also perfect for browsing the New York Times at home with a skinny latte. It pairs better with chunky sandals or platforms (sim), but it was actually chilly here today! So I added funky boots (sim), and for fun: faux pearl chandelier earring (sim). Love the deep pink flowers against sky blue background. I love love love how you’ve paired this house dress and made it so versatile. The dress is beautiful, I do love a pretty floral print! Oh, I think this housecoat is sooo pretty! I modeled a vintage apron at http://gingerwroot.com/what-the-wroot-wore-wednesday-vintage-apron/ and I so appreciate cool vintage clothing…it’s unique and eye-catching! Thanks for sharing! When it comes to clothing, the adage, “They just don’t make ’em like they used to” is so true! The colours and pattern are so pretty with your hair. Hi Patti, I will link back to this Visible Monday next Monday alright? As a lot of readers have already seen my Sunday post. At least I have joined again. Progress. So immensely pretty! That soft, sweet colour palette is spectacular on you, lovely lady. This vintage dress has a perfect print ! Love the colors ! Kisses Patti ! Patti, what a great idea creating “visible monday”! Very cool. I think that the housecoat looks darling on you, and the fit is great too. Wear it everywhere! LOVE the fact that you took a vintage housecoat and wore it as a dress! Isn’t it so much fun to play with pieces, especially vintage ones!! Thank you for hosting Patti. What a stunning piece Patti, much too pretty to be hidden away indoors, it deserves to be seen and admired. It looks in really good nick too. Loving the nails also. lovely outfit, you look beautiful. That dress is so pretty! Oh, this housecoat/dress piece is such a beautiful thing! Lovely floral print and the colour suits you so well! So pretty! Both you and the housecoat. Your housecoat is so pretty on you , so special because of its age , it must have always been so well cared for. Perfect for inside or out. Gorgeous dress/housecoat, I love the color and the print. It looks great on you. That dress/housecoat…..whatever it is supposed to be it is DELICIOUS!! You make it come alive. Your colouring is perfect and the cut is a dream. I think this dress/coat is very feminine and beautiful! Your dress proves that florals stand the test of time. Have you noticed that the print incorporates this year’s Pantone colors? I hope you’ll consider adding your post to my Powers the Flower link up. Very pretty, Patti. Just my style too. I wouldn’t know it’s Monday without you. Thanks. Why do I love this housecoat on you. First, the baby blue looks great with your fair skin and hair, Second, I am a fan of florals, Last, Its vintage and I love that quality! The colors are so pretty on you, Patti! I love how you do vintage with a modern flair. Very cool. You look so pretty and dainty in this house coat Patti – Have a great week!!! Beautiful look. That print is amazing and looks so great on you. Can’t believe you’ve had it for 6 years, still looks brand new! You had me at “vintage”. It is stunning and a very unique item. The fact that it is flattering is great!!! 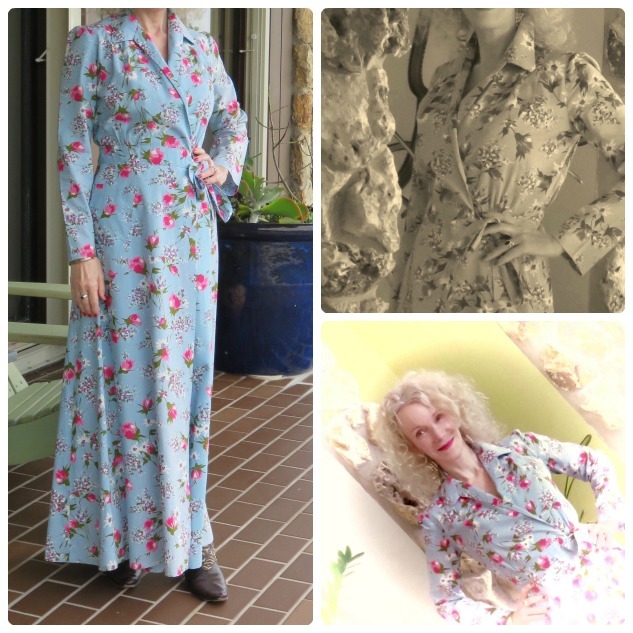 Beautiful housecoat – I would have thought it was always meant to be a dress! Gorgeous colors and pattern. Have a wonderful week, Patti. What a great way to wear a housecoat and the print is so pretty it brightens up a Winter’s day. Great idea to style it with the boots. And whilst you’re having a margarita, would you please pour one for me too? Best dress EVERRRRRRRRRRRRRRRR. I want one, ahhhhhh. There’s something to be said about quality if a piece is still in excellent shape after more than 70 years. Do they still make them like that? Somewhere? This is one pretty house coat and not what I envision a house coat to look like. Thank you for hosting and hope you are having a fab week! Oh my gosh, that housecoat is gorgeous…and I would totally rock it as a dress too! You look beautiful, Patti! beautiful!! i love the florals. Fantastic pattern and swish factor. This is the kind of dress you can swan around in and have fun in. Thanks for hosting your get-together! It helps me stay on track. Hi Patti! I have a dress very similar to yours and I wore it as a duster. It received a ton of compliments. Mine was a dark floral. I love the soft blue hue of yours. The pink flowers look very pretty with your shade of lipstick. Gorgeous color and pattern. Love your pretty nails and lips too. Amazing housecoat. Love the pale blue color. Haha, too beautiful for any arrest. Do you know how much I love that you’re wearing a housecoat as a dress?! It’s gorgeous…far too pretty to be stuck at home. You look so lovely in this dress, it’s not something that many could pull off but you do so beautifully! Thanks for hosting as always! I love it! Definitely a perfect ‘tea with friends’ sort of dress! Vintage is always so special. You and Melanie are great about wearing housecoats as dresses or jackets. The print and colour on this is so wonderful with your skin tone. And it looks like your lipstick matches the red on the piece perfectly! Oh my, Patti. That outfit is adorable!! How I do love vintage housecoats and loungewear from the 30s and 40s, especially to wear for everyday. The prints are always fantastic. Much prettier than anything you’ll see today. And the fabrics are divine! Cool silky rayons, nice crisp cottons and check out this darling seersucker one I have on my site. If it was my size I would have kept it for myself, for sure!! I LOVE it! I can remember my mother wearing a similar housecoat for “entertaining at home”! Beautiful dress/housecoat! The colors are gorgeous on you! Thanks for the link up, Patti. You look ready for some relaxation!! What an adorable print! 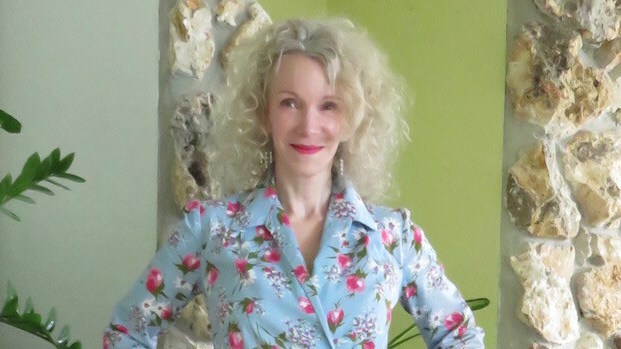 I have a plaid housecoat, also vintage and every time I wear it my teen sons say “mom, what are you wearing?” Comfort and old school style my darlings, lol. You look gorgeous!!! Houseboat or dress it’s stunning!! What a smashing dress/housecoat! I love this relaxed casual, yet dressy, look. Thanks for hosting, Patti! I’ll be linked up shortly.